Samsung Galaxy S4: Smart Scroll video | What Hi-Fi? 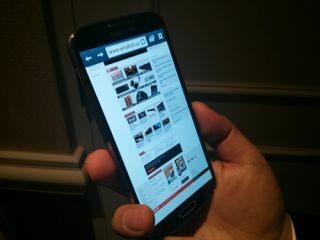 Samsung grouped some of the most exciting new features of the Galaxy S4 under the 'Convenience' header. These include Air View and Air Gesture hands-free control, eye-tracking technology in the form of Smart Pause, and a tilt control feature called Smart Scroll. In this video we give you a quick look at Smart Scroll in action on the Galaxy S4. Smart Scroll doesn't track your eyes but allows you to simply tilt the screen up or down to scroll up and down a web page. This seemed to work fine but also seemed prone to scrolling when we didn't necessarily want it to do so (see more in our hands-on review below). A much longer review will be needed but it will be interesting to see how this feature works out.